Satellite view of Hurricane Lane on Aug. 21. It’s well established that the European weather model, on average, produces the most accurate weather forecasts in the world. For years, the American model, run by the National Weather Service, has ranked third-best. The also-ran status of the American model, known as the Global Forecast System (GFS), has caught the attention of Congress, which has appropriated money to the Weather Service to improve our nation’s weather modeling on multiple occasions. A new analysis of model performance during Hurricane Lane, which unloaded historic amounts of rain on Hawaii’s Big Island, shows that the Weather Service may be making progress. While still considered experimental, the FV3 produced the most consistently accurate forecasts of Lane’s track. Second only to Katrina in damage cost, Harvey hit the Texas coast as expected. Despite warnings that Maria would hit Puerto Rico, emergency responders were not prepared. Five days before hitting Florida, models showed Irma going east. As it veered west, so too did evacuation orders. We obtained a Weather Service chart displaying the track errors for each of the models at different points in time. Track errors tend to be large for forecasts of the storm’s position several days into the future but grow smaller with time. NOAA's Geophysical Fluid Dynamics Laboratory (GFDL) Research Team leader, Shian-Jiann Lin, Ph.D, is behind the new FV3-powered GFDL model. The GFDL model is designed to improve the global weather forecast model by enhancing short-term forecasts and long-term climate prediction. The FV3 produced the most accurate forecasts (or smallest track errors) made four (96 hours) and five (120 hours) days into the future, and was neck and neck with the European model and National Hurricane Center forecasts within 72 hours. The European model, which is run by the European Center for Medium-Range Weather Forecasts in Reading, United Kingdom, had large errors in its forecasts four and five days out but exhibited the skill it is known for within 72 hours as the top performer. 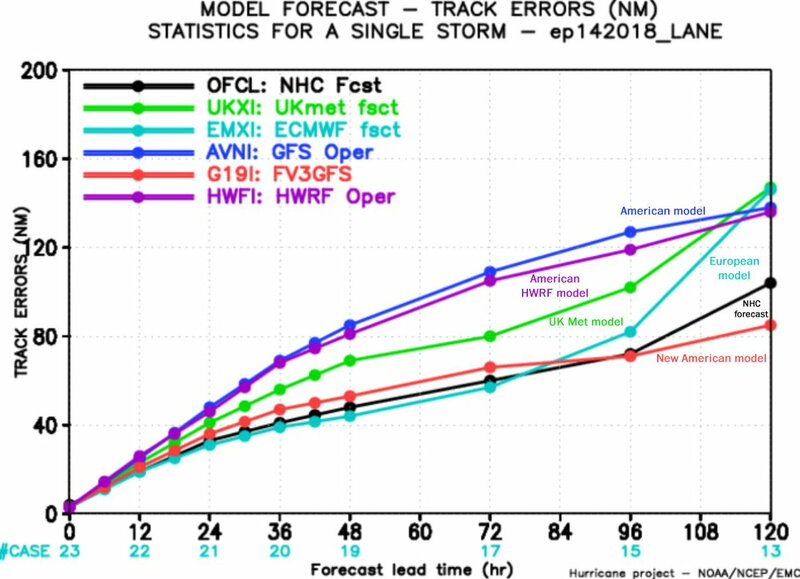 The U.K. Met model, which is the second-most-accurate model in the world and is run by the U.K. Met Office in Exeter, trailed the performance of the European, Hurricane Center and FV3 model forecasts at all times. The current, operational version of the American GFS model had just about the worst forecast performance at every step. The related American HWRF model, which is a specialized model for hurricanes, also performed poorly, ranking second to last. Some of its input data come from the GFS, which explains why both models performed comparably poor. Although the FV3’s results were very promising for Hurricane Lane, they reflect just one very limited case. To be convinced that this new modeling system might close the gap with the European model, we will need to see such performance repeated storm after storm and in everyday weather situations, from the tropics to the poles. The target date for the FV3 to become operational is late 2019. MNN : How well can we predict a hurricane's punch?